I don’t know how many of you have heard about this. If you have not, let me share my experience with you. But before I start let me clarify that these are purely my experiences & my views about this place. Those might be conflicting with others. So after long wait of almost 3 months finally we decided to go for outing this weekend to Sula Vineyards, a place nearby Nashik. We were supposed to leave Mumbai by 7.30 latest but unfortunately things didn’t happen as expected. Since we have decided to hire a car instead of taking our own cars, we were waiting for the car.But unfortunately,we came to know that car sent by the travel company was 6 seater while we were 7. That was just the start. We sent the driver back & the hunt begins for alternate car. Myself, Himesh & Vinay started dialling all our feasible contacts who can provide us with the car. Somehow Himesh could hire a car, by the time all this drama was going on, we had a good breakfast with a cup of tea at Himesh’s place.Thanks to Auntyji! Best thing was playing around with little Swara, Himesh’s daughter. Oops! I think I’m diverting the topic, that’s obvious since the captioned topic itself is very boring. Anyways let’s go back to the Sula Vineyards. So finally our car came by 10AM. That’s already 3 hours late. We headed towards Nashik but hardly after 5 kms, we stuck up in traffic. That was disappointing, since we were running low of energy after the cab hassle & now this traffic. Thanks to Pallav atleast he was trying to cheer all of us saying “Be positive….” (But come on how can I be, I’m O positive… Oops! I know that was real bad PJ) After almost half an hour we could get rid of the traffic. Driver was the different species on the earth, probably just another type of person, he was continuously on the phone inspite of being aged. Yes, while driving also, he was comfortably attending all his calls. He reduced his number of calls, only after Himesh warned him not to do so, but he reduced, he didn’t stop. Somewhere around 2’o clock, we reached our destination. All we could see, was a huge area covered with plantation of various types of grapes. (Obviously, you can’t identify various types but atleast that’s what the guide told us). Four of us registered for tasting wines. Then, guide took us on a walk, told us about the history of vineyards, who started this vineyard & why is the name so? Interestingly, SULA (SULAbha) is the name of Owner’s mother. He decided to pick up only first four letters. After the tasting session was over, we headed for lunch. Half day is almost over. Now, you must be thinking, what I’ve enjoyed in this half day? Nothing… absolutely nothing… I don’t drink, so I didn’t taste Wine, furthermore it was saturday, so I couldn’t even eat non-veg. Oh! come on dont even ask me how was the crowd, because there was no crowd. We were the crowd,nobody was there except 7 of us. Even our driver disappered after sometime 🙂 Thank God, we didn’t take our own cars, otherwise I would have been one of the most frustrated as well as exhausted person after driving 400Kms just for a veg lunch. In fact, thanks to Divya, the well-wisher of our team who actually suggested to hire a car & thanks to Pallav as well, who took efforts to hire a car. Post-lunch we had a mandatory photo session. Come on, we were on weekend outing, we have to convince ourselves. Then as expected, 4 of us had some wine & that’s all; we were done for the day & we left for Mumbai. Ok I understand those who drink, had nice time but guys tell me very honestly, going all the way 200 Kms just for a glass of Wine (Trust me that was not even full, I should say half glass of wine), spending 7-8 hours in travelling, is it really worth? Come on guys, let’s go to my farmhouse, hardly 90 Kms from Mumbai, that’s 2 hours drive. Just imagine, you can have wine there too (I think even SULA your branded wine as well). Just imagine, 4.30 in the evening, on carrom board, with a cup of tea or wine whatever you like, sounds good right? 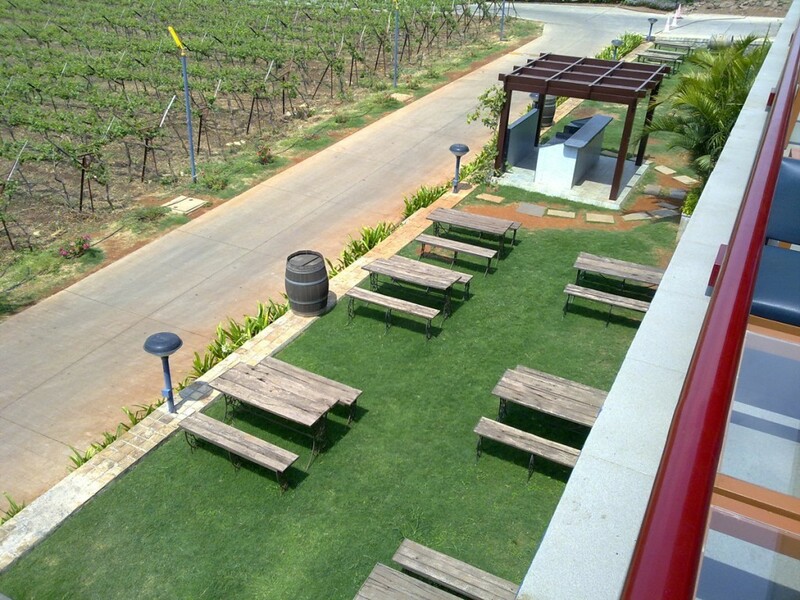 For me Sula vineyards, is definitely thumbs down. But even those who drink, why to go 200 Kms,for just a half glass of wine?